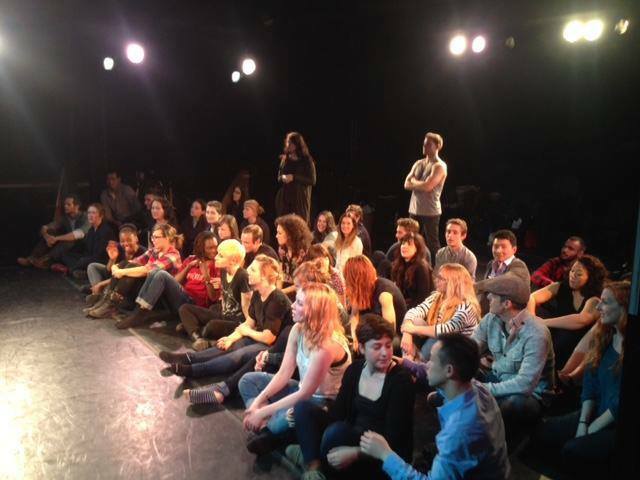 The COMEDY Intensive prepares actors for their comedy auditions, comedy set work, and somedy stage work by working from scened culled from comedy pilots, series, and film... which will be given in advance. COMEDY takes DISCIPLINE! Off book. Playing off the partner. Living the emotional circumstances. And finding the moments...AND ALSO knowing the comedic approach. Knowing COMEDIC scene analysis. Absorbing comic scene structure. Knowing and Playing the Rules of Comedy. MORNING DAY ONE Explore examples of breaking down scripts for comedy, and the rules of comedy. AFTERNOON DAY ONE : Practice comedic exercises. Reheasre the comedic scenes and run through for notes. AFTERNOON DAY TWO: Warm up and run scenes for an invited audience. Audi­ting is not available for this workshop but everyone is invited on Sunday evening to see final scenes and meet Paul. Com­plete the registration form below. Note that pay­ment is required to con­firm your reg­is­tra­tion. When you com­plete the form and click ‘Com­plete Pay­ment and Con­firm Reg­is­tra­tion’, you’ll be taken to our Pay­Pal form, but if you don’t have a Pay­Pal account you can use any major credit card. Also note that can­cel­la­tions will be accepted up to 96 hours prior to the start of the class. If you let us know in writ­ing within this time frame, we’ll refund your pay­ment less a $50 pro­cess­ing fee. After this time, your pay­ment is non refund­able. What would you like to achieve as a result of attend­ing this workshop? Would you like to be automatically subscribed to the Actor's Foundry Newsletter? WAIVER OF LIABILITY AND RELEASE I, (Name typed above), understand and acknowledge that the class/workshop/seminar that I am participating in with the Actor’s Foundry (“AF”) is physically and emotionally demanding and I fully understand and acknowledge that there are risks and dangers associated with participation in the class/workshop/seminar. I hereby assume any and all risks associated with participation in the class/workshop/seminar, including, without limitation, the risk of physical or mental or emotional injury, minor or severe bodily harm, and/or illness, which arise by any means, including, without limitation, any and all acts, omissions, recommendations or advice given by AF or their agents, employees, or other persons or entities affiliated with AF and/or relating to or arising from my participation in the class/workshop/seminar. I agree to exercise all necessary caution during the class/workshop/seminar. I also agree to inform AF of any significant aspects of my physical or emotional condition or medical history that might increase the risk to myself or others. I hereby voluntarily and knowingly, release and discharge AF, its employees, agents, affiliates, directors, officers, insurers and assigns of and from all manner of claims, actions, losses, liability, costs, damages and lawsuits of any kind that I now have or may have in the future by reason of any matter, cause or thing related to or arising from my participation in the class/workshop/seminar. I hereby authorize, consent and grant permission to AF and all of its employees, sub-contractors, affiliates, and agents to photograph, document, film, videotape and record my performance and/or participation in the class/workshop/seminar. I hereby grant to AF, and those acting with its authority and permission, the absolute right and permission to copyright and use, reuse, publish and republish photographic portraits, pictures, videos and/or sound recordings, or any part thereof, that may have been taken or made of me and I acknowledge that such material shall be the property of AF.